It’s a mantra that Lowry, an assistant professor of hydrogeology at the University of Buffalo, follows while seeking to understand how water moving through watersheds changes over time across the Great Lakes region. He can’t collect data from more than 50 places at once himself. So Lowry is recruiting citizen scientists in Michigan, Wisconsin and New York. His new phone app, CrowdHydrology, allows anyone to send information on stream depths in specific locations with the swipe of a thumb. It will be unveiled today at the American Geophysical Union meeting in San Francisco. These citizen scientists can view the closest stream gauging station that Lowry’s program runs in partnership with the U.S. Geological Survey. There are 19 in Michigan, 13 in New York and 17 in Wisconsin. 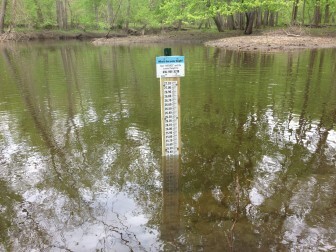 Each has a sign with brief instructions on how to report on your phone what the gauge shows to be the water’s depth. The gauge is simply a ruler that has been mounted in the stream. Visitors can then access the CrowdHydrology app to send in the height. With a smart phone, the location, time and date is sent automatically. Non-smartphone users already can text 716-218-0282 with the height, location and date. Five minutes after citizen scientists send in their readings, the data is viewable on the CrowdHydrology webpage. A copy of the map is below. Click underneath for a larger version of the map. Click on some of the map markers to reveal data. The information can be used for free by researchers, parks officials, educators and other citizen scientists. It is useful for seeing how rain and snowmelt increases stream levels and if the water level is appropriate for activities like fishing or canoeing. Lowry’s colleagues have helped spread the concept to a site set up in Utah and another four in Iowa. After seeing other successful data crowdsourcing projects like one used in California and Maine to record road kill, Lowry and his co-founder Mike Fienen, a research hydrologist for the U.S. Geological Survey, created the app available on all mobile platforms. Researchers with a special interest in the Great Lakes region would be interested in using the stream data, Lowry said. Citizen scientists that visit recreational areas are his targets for making it work. Jill Martin, an interpretive naturalist for the Indian Springs Metropark in White Lake, Mich. is setting up several stations there. There were an estimated 70,762 total visitors to the park in 2013. If just a fraction of them used Lowry’s application they could provide substantial data for the project. Martin helps operate the park’s environmental discovery center, which educates the public on river and stream ecology. Howard Reeves, an assistant professor of civil and environmental engineering at Michigan State University, has been supporting Lowry’s work by instructing other educators about the CrowdHydrology project and its uses. “I’ve always had personal motivation to help educators by helping them see and experience themselves,” Reeves said. But another important part of education is teaching others how to use these resources. The groups Reeves teaches can further facilitate the CrowdHydrology project. “If [recreational areas] put a number of river gauges out in different watersheds, we can learn something from those observations,” Reeves said. If you would like to contribute stream data, find the nearest station on the CrowdHydrology website to make sure it is open. Many stations are still in the process of being set up. 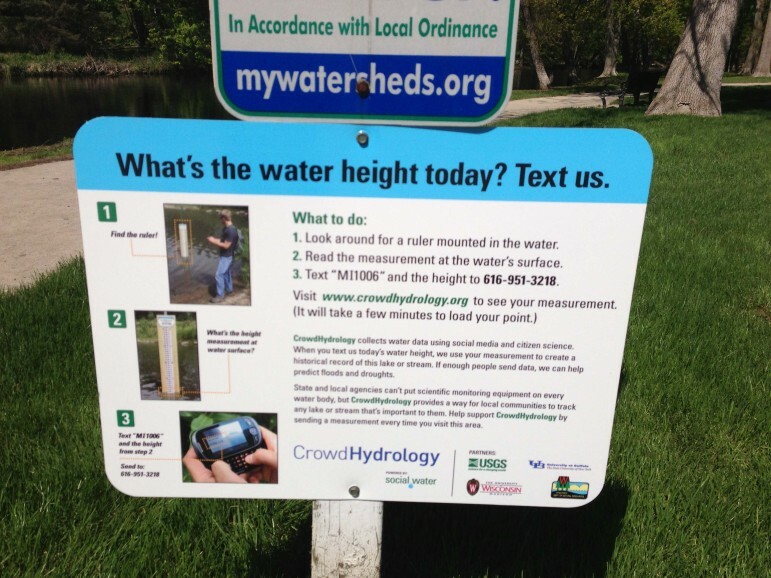 Until the CrowdHydrology app is released, citizen scientists can text their site number (which is given at each station) and measurement reading. With the number of smartphone users rising, Lowry and his colleagues are turning the adage “We are all scientists,” into a reality.